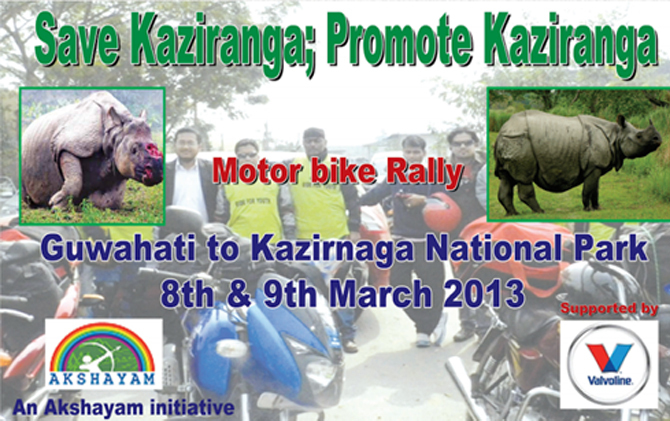 A motorbike rally from Guwahati to Thimphu Bhutan to promote sports among the underprivileged children. A group of 10 sports coaches of various disciplines will undertake this week long expedition to create awarness about the importance of sports and why all children must have access to basic sports infrastructure and training. Akshayam, a non government organisation has been set up with the aim of providing a new way of social and moral development among the underprivileged youth of the modern society through promotion of sports, culture and eco tourism among them. As a part of the initiative, a 12 member team of volunteers from different sports field have come together to ride for this cause. The group will undertake a long and perilous road trip from Guwahati to Kathmandu, Nepal to create awareness among the public about this noble cause. All member of the group, besides being highly skilled in their respective profession, are also skilled rider and have previously taken similar expedition to Tawang, Arunachal Pradesh to promote the cause. The journey will start on 17th of February 2011 from Guwahati and throughout the trip, the group will make a number of pit stops during which they will interact and share their special skills with groups of under privileged youth in those locations. The major point of focus will be Goalpara, Bongaigaon and Kokrajhar in Assam and Siliguri in West Bengal on the Indian side and Kakarbhitta, Kathmandu and Bhaktapur in Nepal. The team will also distribute sports equipments and books among the underprivileged children during the trip. A week long summer camp has been organised by Akshayam at its DIspur cemtre located in Aarohan,Wireless from 18th to 24th july 2014.The camp is open for the children from the age group of 6 to 16 years.Special interactive session on Chess, English grammer,General knowledge and Assamese will be held during the camp.Interested students may contact the organisers on 8761951381,9954136181 for details.? Dear members and well wishers,Greetings! You are cordially invited to the Annual General Meeting of Akshayam to be held at our office in Aarohon Building, Wireless guwahati on 23rd February 2014 at 2:30 pm. Please reply with your final confirmation on this mail or over text or call at 9954136181 We look forward to your meeting you. Akshayam, a premier sports promotion organization is organizing a Special Chess coaching camp at its 'Chess Learning Centre' at Aarohon, Wireless from 13th April to 17th April 2013 in view of the Bihu holidays and upcoming International Chess meet in the city. The camp will be held in two session viz 10 am to 2 pm and 4 pm to 8 pm. Interested students may contact the organizer for registration on 9954136181.